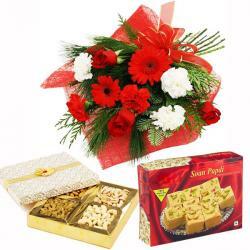 Product Consist : 4 Diwali Diyas + 5 Bars of Dairymilk Chocolates (Weight : 13 Gms Each) along with Bouquet of 30 Pink and White fresh Exotic with Seasonal Flowers with Lots of Green fillers. 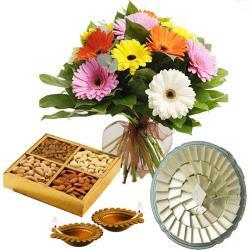 A delightful treat like this hamper is a must on the festive occasion like Diwali. This hamper comes with a Cadbury Dairymilk Chocolates that is ready to treat your taste buds. Along with it thirty pink and white fresh flowers bouquet. 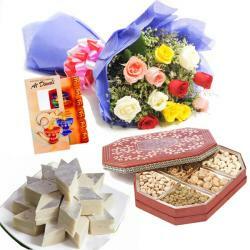 These too lovely inclusions of chocolate and flowers in this hamper its make the hamper worth it. It is paired with a set of two earthen diyas which are beautifully hand painted and are bound to leave you enthralled with their charm. 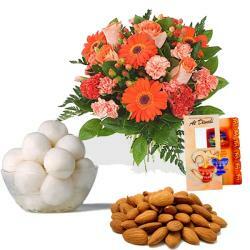 So, order this hamper online today and greet your loved ones warm with it. 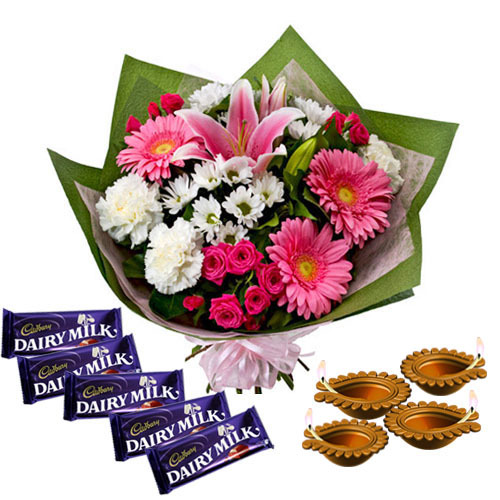 Product Includes : 4 Diwali Diyas + 5 Bars of Dairymilk Chocolates (Weight : 13 Gms Each) along with Bouquet of 30 Pink and White fresh Exotic with Seasonal Flowers with Lots of Green fillers.